SL Prime Minister Ranil Wickramasinghe was talking about the process of urbanisation and about setting up an economic corridor linking Colombo and Trincomalee. Mr Wickramasinghe was addressing media, intellectuals, and public servants on Wednesday. “The region from Mannar to Trincomalee would be brought under development. The road network linking Mannar, Trincomalee through Kandy and Dambulla and Colombo and Hambantota, would promote developed economic zones,” Daily News reported Wickramasinghe as saying. Responding, Tamil activists for alternative politics in Jaffna said the UNP regime, after consolidating itself in Colombo and Geneva with the collaboration of ITAK, is now going to accelerate the structural genocide against the nation of Eezham Tamils through so-called urbanisation. While SL President Maithiripala of the SLFP is accelerating colonisation of interior border areas of Mullaiththeevu, Vavuniyaa, Trincomalee and Batticaloa, the UNP is going to do the same through massive industries and so-called infrastructure ‘development’, they said. Wickramasinghe was addressing media along with SL Minister of Megapolis & Western Development Champika Ranawaka, a well exposed Sinhala extremist. ‘Patali’ Champika Ranawaka, now in the UNP is a former militant JVPer from the 1980s. He agitated against the Indo-Lanka accord and had later split from the JVP contradicting with the militant ‘Marxist’ founder of the JVP Rohana Wijeweera. He was a principal founder of Sinhala extremist National Movement Against Terrorism (NMAT) in 1998 and Sinhala Urumaya (SU) in 2000. Ranawaka was also known for his Nazi shade of anti-Semitism in his speeches comparing the Tamils with the Jews and the Sinhalese with ‘Aryans’. 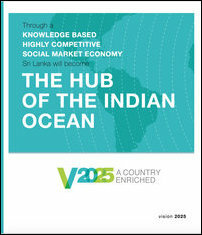 Mr Wickramasinghe was referring to the ‘Vision 2025’ plan launched in 2015. The implementation was delayed for the last five years as his government was spending its energy on resolving the huge debt problem. “What the government did was to use the five years to lay a solid foundation for the 10 year development plan,” he said. The World Bank and the International Monetary Fund (IMF) were charting a ‘development’ discourse through Ranil Wickramasinghe's government in 2015. 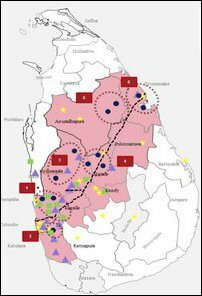 It was named ‘Vision 2025’ and was aiming to sophisticatedly sustain the Colombo-centric system, which is institutionally genocidal against the existence of Eezham Tamils as a nation in the North-East. The WB-IMF outlook was based on the 2013 ‘Singapore principles’, which was a ‘reformist’ (revisionist as far as Eezham Tamils are concerned) approach aimed at securing the backing of Tamil voters in the homeland through locking the ITAK and a section of Tamil diaspora groups which were popular at that time in to quisling politics. The masters of the outlook promised cosmetic constitutional changes to resolve the ethnic question and stressed that transitional justice measures would ensure non-recurrence of crimes. However, even those among the Eezham Tamils who were inclined to believe the promises have now realised that these constitutional changes are not going to change any of the fundamental reconfigurations to resolve their national question. In the meantime, the post-2009 structural genocide has further aggravated into a heritage-genocide in recent months. The unworkability of the transitional justice discourse was proved by the claims made by all sections of the Sinhala leaders, including the SL President and the SL Prime Minister. The anti-Muslim pogrom in 2018 also exposed the invalidity of the ‘non-recurrence’ promises. However, the architects of the Vision-2025 are still determined and relentless in their efforts to lock the Tamils to the failed roadmap without any international guarantees. They want the Tamils to believe that the continued UN Human Rights Council (UNHRC) engagement in Geneva is an ‘international guarantee’ for Tamils. As far as the Eezham Tamils are concerned, the UNHRC discourse, which systematically avoids to deal with the crime of genocide and is influenced and managed to skip international investigations at every juncture, is not a guarantee but a trap commented Tamil activists for alternative politics in Jaffna. Tamils are going to witness an accelerated ‘development’ genocide in the next phase, they warned. 22.03.19 UNHRC ‘Sri Lanka’ roadmap premeditated not to deliver genoci..